Really fun salt and papper shakers manufactured by Blue Sky Clayworks and designed and signed by Canadian artist Heather Minc. She calls this collection "Hot and Steamy" She is known for her whimsical and imaginery designs. Measurements 2.76” x 4.72” x 4.33”. 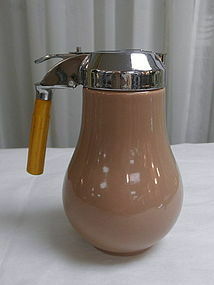 1950's tan syrup dispenser by Vernonware California pottery with a butterscotch Bakelite handle. In good condition, no scratches, no micro abrasions, no cracks. There are 2 or 3 very tiny glaze pops and there is a chip that can't be seen when the metal cap is screwed on (see 2nd photo). The color is tan with a slight pinkish hue. In excellent working condition, the dispenser measures 5.5" high. 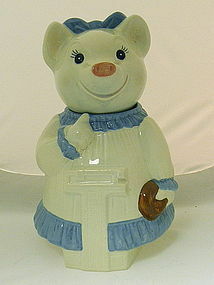 A really cute Metlox Slenderella Collector Cookie Jar with a little girl pig holding a doughnut and standing on a set of scales that say "WATCH IT" with weight starting at 100lbs going up to 300lbs. Marked "Metlox Calif, USA" an in excellent condition, the jar measures 12.75" high.